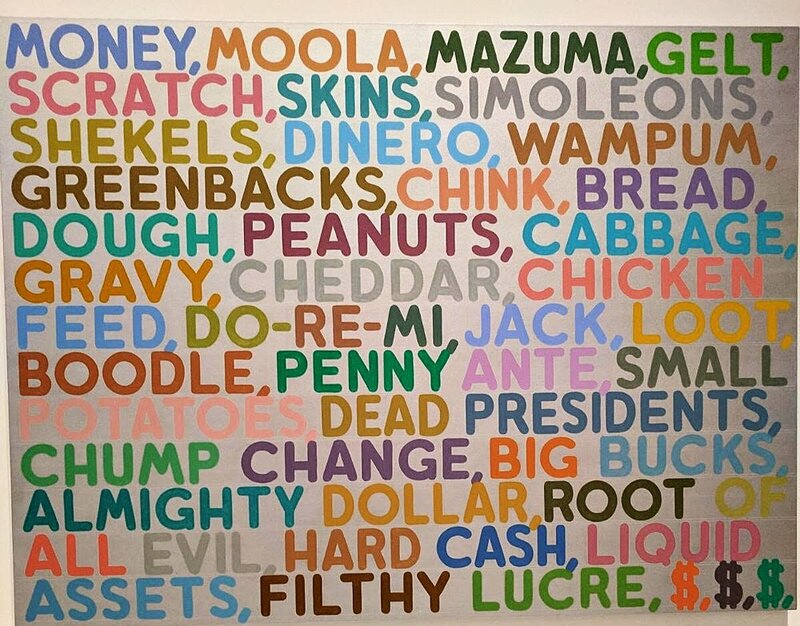 Money by Mel Bochner. Smithsonian American Art Museum, Washington, D.C.
Washington, D.C remains to be one of my most favorite American cities to visit. As a political science major in undergrad, and my current passion in urban planning- I have instinctively been drawn to the many juxtapositions offered in the District. In the one hand, Washington D.C represents the core of our democratic structure with its many national monuments and the home of our Executive, Legislative and Judicial branches. However, those same democratic values are stripped from the 600,000+ residents of the District as D.C holds no representation in the U.S Senate due to its complicated structure and its lack of statehood. With the rainy weather + cold September reminding us that Fall was approaching, we headed to Bantam King to enjoy some ramen. What came next was a pleasant surprise. With a beautifully lit + art decor venue, Bantam King offers a great selection of Japanese chicken ramen and tasty delights. After Bantam King + Ramen galore lunch, we took a stroll through D.C's Chinatown. Walking through the area, I couldn't help but notice the lack of identity. If it wasn't for this famed arc and structure which is now more symbolic than actually meaningful, nothing else would really distinguish this area of D.C from its many other famed neighborhoods like Dupont Circle or Foggy Bottom. An iconic structure signifying the entrance of Chinatown in Washington D.C. However, upon closer look- Chinatown D.C resembles more of a downtown mall than a cultural epicenter. The character of the neighborhood has been lost to corporate structures like Starbucks and Walgreens. No longer do you see the cultural and ethnic representations which have long marked these immigrant enclaves in various American cities. 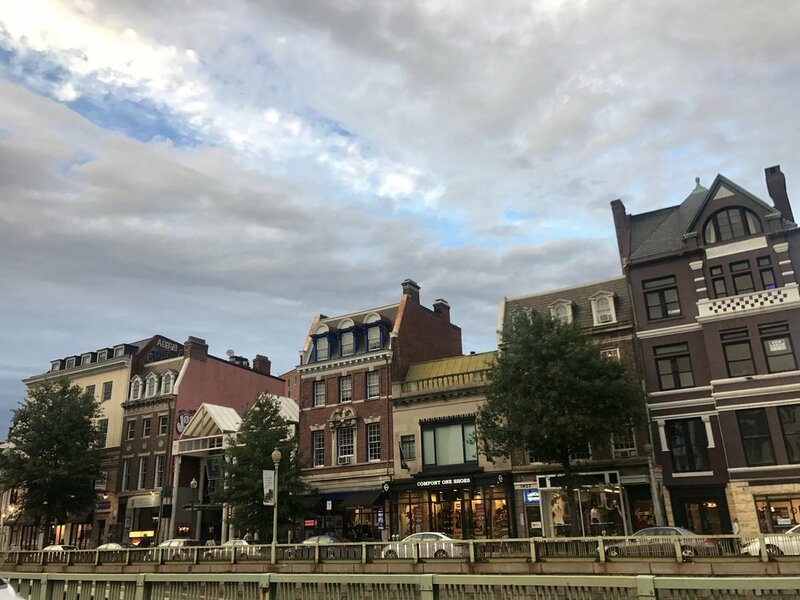 Few Asian shops and restaurants line its streets, and many of them are holding on to stay in the area due to increased prices in the District's booming real estate market. Reflecting on D.C's Chinatown woes- I also feel the need to mention Boston's own problems with the preservation of cultural heritage in its own Chinatown neighborhood. The current state of Boston's Chinatown neighborhood reflects a disappointing pattern in dense urban cities which are now struggling to keep rents affordable, and in turn are losing core residents which maintained the cultural flavor of these immigrant clusters. In the midst of an economic boom, how do we ensure culture + identity are preserved in a growing urban area? Paik's Electronic Superhighway installation at the Smithsonian's American Art Museum was super dope! The installation reminded me of how connected our continental U.S is, and how much we still rely on the car as a mode of transport and its representation of individual freedom. I've recently pushed away from driving, and I'm pushing myself to walk more, and rely less and less on a car. It's not always easy, but its definitely been helping my waistline! Let's see what happens when winter creeps up tho.......sigh. It rained heavily during most of my weekend trip in D.C which meant scouting for street art was much more challenging. Luckily, D.C boasts some of our nation's best museums, many free of charge so I took the liberty (no pun intended) to visit the Smithsonian's American Art Museum and The U.S. Holocaust Memorial Museum. Honorable Mention: The National Museum of African American History and Culture! Try as we might, we were unable to get the coveted same day passes for entry, which only means I'm gonna have to come back to D.C soon to visit! My girls + I decided to hit the town and made reservations at my local fave, Boqueria. 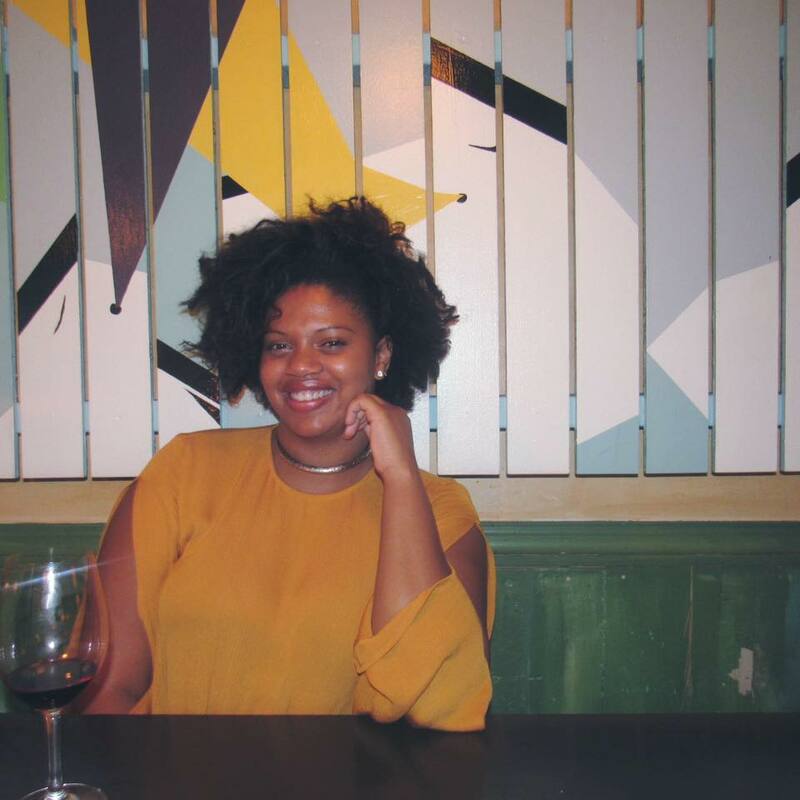 The Spanish tapas restaurant is my go-to whenever I'm in D.C and this will make my third visit there. As always it did not disappoint! 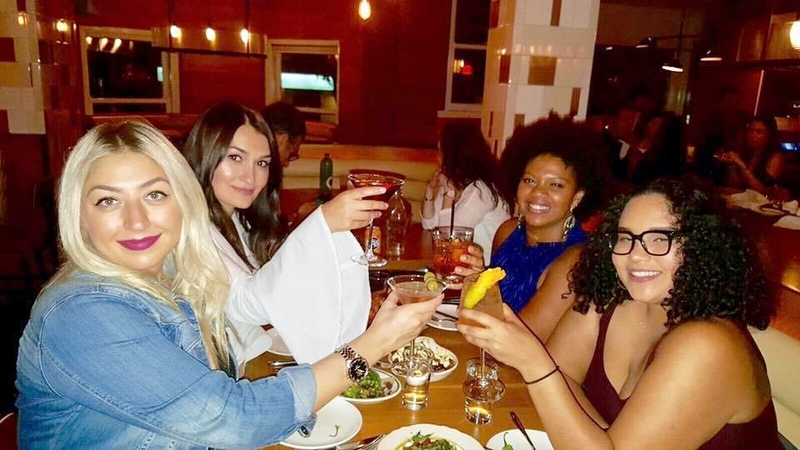 The food is fresh, the ambiance is very chill, and the drinks are always on point! Reminds me so much of Barcelona, Spain and its tapas scene. Good food x Good vibes. Leyla's top just stole the whole shot! Wide-bell sleeves are a must for a new take on a 70s trend. After din din, We ended up a dope night spot called Decades, which is filled with a retro themed decor celebrating 80's, 90's and 00's music. The whole venue screamed hip-hop! If you're ever in D.C and in need of a good bumpin' night- definitely check this place out! Claaaaaaaaaaaaaaaaaaaasics. Hip-Hop Wall, Decades, D.C.
During our stay in D.C., we were fortunate enough to stay in a great location near Dupont Circle- an area in D.C. known for its many bars + endless array of restaurants. D.C. always offers me so much perspective and reminds me of the cool, calm and collected light that I love about urban cities. With its many symbolic structures and history facades, D.C still remains a modern mecca of the old and new. Each time I visit, I'm always surprised by the new experiences it offers and intrigued by the district's character.